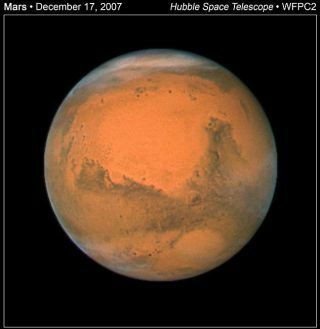 Mars makes its closest approach since 2003 on Dec. 18, 2007 at 6:46 p.m. EST. Mars iscloser to Earth now than any time until the year 2016, offering skywatchers agreat look. The HubbleSpace Telescope took advantage of the opportunity, too, photographing the redplanet earlier this month. The images were pasted together into a video showingMars' full rotation. The redplanet is now the brightest "star" in the evening sky, easily visibleby mid-evening until dawn. It comes closest to the Earth today at 6:46 p.m.EST, when it will be 54,783,381 miles (88,165,305 kilometers) from us. Mars lookslike an orange star to the naked eye, but it's revealed as a disk with many featuresin modest telescopes. It will put on a good showall month. Although2003 offered astronomers a view of Mars 20 million miles (32 millionkilometers) closer than this year's approach, Hubble's most recent detailedlook at the red planet shows it's free of dust storms. However, ice crystal cloudsin the northern and southern polar caps can be seen. Two darkpatches lie just south of the equator in Hubble's view: The large triangularshape to the right is Syrtis Major while the horizontal lane to the left isSinus Meridiani. NASA's Mars Exploration Rover named Opportunity landed in thewestern part of this region in January 2004. As theMartian winter closes in, Opportunity's dust-ladencompanion called Spirit is scouting out a place to survive the poorly litwinter for about six months.